Spinal Decompression is a traction based treatment that treats many spinal conditions such as disc injury/herniation, neck/back pain, stenosis, sciatica and arthritis. It is also used for general health and wellness. During a Spinal Decompression treatment the discs, joints and surrounding soft tissues are gently stretched to improve alignment, movement and nutrition to the spine and tissues. 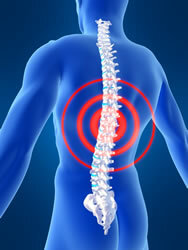 Vibration therapy and exercise are also used to relax the spinal musculature and improve treatment results. Spinal Decompression creates a "negative pressure" that can reduce disc bulge/herniation and allow the disc to heal. Treatments are comfortable and patients regularly feel relief for both acute and chronic conditions. Today's lifestyle habits place the spine under a great deal of stress. Activities like working at computers, looking at cell phones, driving, sitting, lifting and bending all take a toll on our neck and back. Spinal stress is cumulative and will result in pain and loss of function over time, often resulting in forward head posture and slumped shoulder postures. This can worsen over time and and negatively affect your health to a great degree. Spinal Decompression can help fight the effects of gravity, aging and the demands of today's lifestyle. Please contact us for more information on how Spinal Decompression can help you.